Fusarium head blight (FHB) caused by Fusarium graminearum is one of the most important diseases of wheat in humid and warm areas. It reduces yield and seed quality significantly. Knowledge on fungal infection of wheat spikelets is essential in effective control of FHB disease. Adult plants of the cultivar FALAT and the line ERN92–4 were inoculated at anthesis stage by injection of 10μl spore suspension at concentration of 5 × 104 per ml in medial spikelets using point inoculation method. The number of infected spikelets was counted 7, 14, 21 and 28 days post inoculation (dpi). At 4, 8, 24, 48, 72, 84 and 120 h post inoculation (hpi), parts of infected spikelets were observed with light microscopy and TEM. Disease severity (percentage of infected spikelets per spike) in line ERN92–4 significantly differed from the cultivar FALAT at 14 dpi and 21 dpi. Hyphal colonization and germination of spores in line ERN92–4 spikelets were more than in FALAT spikelets. Light microscopy and TEM observations indicated that mycelium penetrated into the cells through the stoma and spread to other cells via cell wall or plasmodesmata. The fungus exhibited biotrophic and necrotrophic life styles at 24–84 and 120 hpi, respectively. 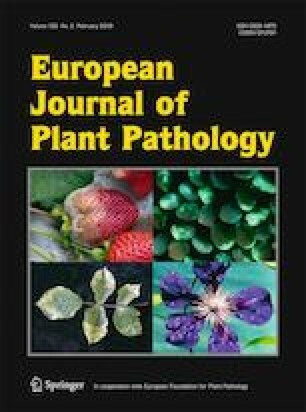 Accumulation of lignin displayed a different pattern during the activation of plant defense responses, and showed brownish sites on the infected florets at 72 and 120 hpi. From 72 hpi, lignin accumulation was observed in both the examined cultivar and line, and elevated lignin accumulation reached by 120 hpi in both treatments. With the exception of the initial stages of infection of florets, defense response of none of the both genotypes was effective in the suppression of disease progress, as, F. graminearum is a necrotrophic fungus; however, lignin and O2− accumulations were increased at 4 to 72 hpi. This work was financially supported by Tarbiat Modares University, Iran. The authors would like to thank Institute of Biochemistry and Biophysics (University of Tehran, Iran), Shahid Beheshti University of Medical Sciences (Shahid Beheshti University, Iran) and Cereal Research Department (Seed & Plant Improvement Institute, Iran) for providing Ultramicrotomy, TEM and F. graminearum and seeds of cultivar FALAT and line ERN92-4, respectively. All authors are fully aware of this submission and have declared that no competing interests exist. This study did not involve any human and/or animal participants.